The Ministry of Health and Long Term Care (MOHLTC) provides funding for ROMP to deliver educational experiences to medical students and residents from medical universities in Ontario. Help shape today’s medical trainees; they are tomorrow’s physicians. Preceptors act as guides, as mentors, as role models and as teachers for trainees at all stages of their medical education. 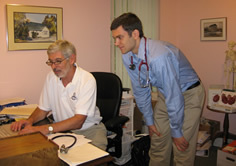 Through the one-on-one teaching model of community based training, rural preceptors have the unique opportunity to impart the benefits and balance of their lifestyles as rural physicians. Preceptors give direct and immediate feedback to the learner throughout the rotation, increasing the learner’s abilities, awareness and self-confidence. Submit our Teaching Application to become a ROMP Preceptor. Read below for more information on teaching with the Rural Ontario Medical Program and the Teaching Application Process. If you are interested in becoming a ROMP preceptor, take the time to read Becoming a ROMP Preceptor. Contact the ROMP office if you have any questions regarding the application process. If you would like to become a preceptor with ROMP, please complete a Teaching Application and submit a current CV to the ROMP office. Once your teaching application has been received, a Preceptor Package will be mailed to the address indicated on the application, which includes more detailed information about the structure of the program, funding information and the CPSO Guidelines for teaching residents and medical students. It is also important to make yourself familiar with the PAIRO Agreement, which is the regulatory body for resident medical trainees. The ROMP – Preceptor/Learner Policy Manual outlines the roles of both preceptors and learners within the ROMP community. Please fill out the online Teaching Application. The Teaching Application will open as a pdf document. Please fill out the fields on your computer and click the “Submit by E-mail” Button at the top right. Please save or print this application for your records. An updated Curriculum Vitae must be submitted with your teaching application. For guidance on preparing this document, please read our CV Guidelines. Once you have hit “Submit By E-mail”, you will be prompted to select the type of e-mail used on your computer. If you answer your e-mail through a program such as Outlook Express, please choose “Desktop Application”. If you access your e-mail by logging into a website, please select “Internet Email”. If you select “Internet Email”, you will be asked to save the document to a location that you can access and manually attach to an e-mail message. If you select “Desktop Application”, a new message will open, with the Teaching Application as an attachment. The body of this message obtains standard instructions for our office to compile data and are not instructions for the sender. Please make the subject line of your e-mail ROMP Teaching Application. If you have a current CV, please also attach it to the e-mail. 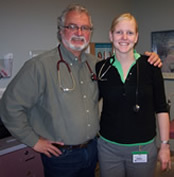 The Rural Ontario Medical Program receives a steady stream of applications for rotations within the ROMP region. ROMP will contact physician preceptors within the requested community to match learners with appropriate physicians. ROMP offers administrative support to physicians who chose to take medical students and clerks into their practice and the hospital. ROMP will credential the learner and secure hospital privileges, ensuring that liability and malpractice insurance are covered by the medical school. To avoid preceptor burnout, the Rural Ontario Medical Program takes steps to ensure that preceptors are matched with a variety of learner levels and given adequate breaks between rotations. ROMP is also able to offer a modest teaching stipend to physician preceptors who teach certain rotations. Note: ROMP provides the same level of support and development for both undergraduate and postgraduate preceptors. Two ways that the Rural Ontario Medical Program is able to offer support to physician preceptors are through Faculty Appointments and Faculty Development sessions. Please read more about how ROMP can assist you!